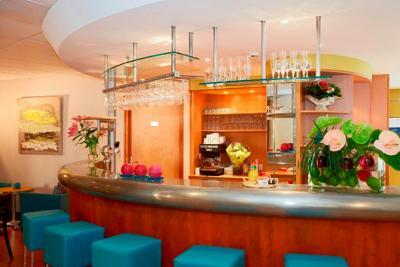 Lock in a great price for Novotel Suites Wien City – rated 8.3 by recent guests! Very, very close to Vorgartenstrasse(U1) metro station. 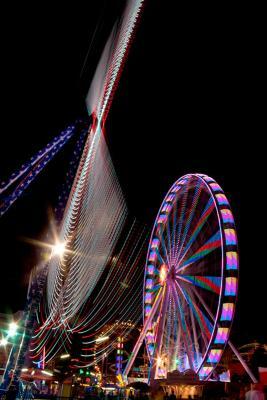 The hotel is situatead just one metro station away from Prater Park and 3 stations away from City Center. Using S7 train you can arrive very easy from airpory to the hotel ( take S7 train from airport to Prater station and from Prater station take metro one station to Vorgartenstrasse(U1) ). The room, bath and restroom was sparkling clean. Very comfortable big room for 3 persons. There was a table, microwave, fridge in room. Drinking water tap saparately. Very quite and safe location. Supermarket in front. Metro 1 min walk. 3-4 stops to Stefanplats. We left lagguage for a day free. Staff was very helful. Lobby very comfortable. when I am back in Viena I will stay there again and reccomend everyone!!!! Spacious room, good location near metro station, parking (garage) 12eur per day, friendly staff. Great location just 3 minutes from metro. The room was spacious. Staff was nice.The room quite old and one of the chair look bit dirty. Apart from this, everything was fine. Bed was good. Large room. Bathroom very nice with both bath and shower. Very close to Vorgartenstrasse station. Very close to metro station. Toillets perfectly clean. The room was nice and big. the bed was superkingsize and I slept like a baby. Staff was super nice and help me with plane ticket and so on. The hotel was close to the metro station few stops from the city center. The room was very nice, clean, air conditioning worked perfect. The location was as said, 200 meters from a Subway station Wich was great for us as we travelled quite enough with the subway. Novotel Suites Wien City This rating is a reflection of how the property compares to the industry standard when it comes to price, facilities and services available. It's based on a self-evaluation by the property. Use this rating to help choose your stay! 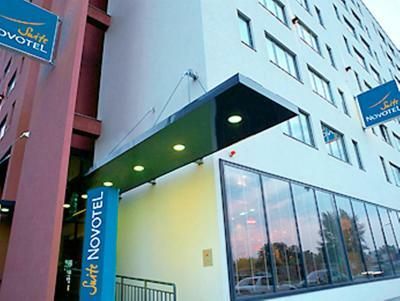 Novotel Suites Wien City is located in the immediate vicinity of the Messe Wien (exhibition and congress center) and the Austria Center, and only a 10-minute underground ride from the city center with famous sights like the St. Stephen's Cathedral. The hotel offers air-conditioned rooms, a 24-h gourmet food counter, a gym, and a business corner with free high-speed internet and WiFi. Guests receive free biscuits and coffee during breakfast. Bottled water is provided in all rooms, and tea and coffee are refilled every day. There are free massages on Thursday evening. Garage parking is available as well at the Wien City Novotel Suites Wien. The Prater Amusement Park can be reached within a 15-minute drive, and the Vorgartenstraße Underground Station is just 350 feet away. When would you like to stay at Novotel Suites Wien City? Spacious suite with a microwave, a refrigerator, a kettle and internet access via TV and on-demand films free of charge. Please note that the maximum occupancy is 3 people. This midscale brand proposes large rooms equipped with a cosy sofa bed which can accommodate families. House Rules Novotel Suites Wien City takes special requests – add in the next step! Novotel Suites Wien City accepts these cards and reserves the right to temporarily hold an amount prior to arrival. Please note that the free massages on Thursday evenings are between 18:00 and 20:00. Baby cots are available upon request and need to be confirmed by the property beforehand. 1. Only one Iron & ironing board for whole hotel 2. The bathroom door was see through. We checked in at 15. But room cleaning finished at 15:20. Reception did not to say sorry. The mattress could have been a bit more comfortable but of course, this is always a matter of taste. Our room was right next to a children's play corner where things got a bit too loud a bit too early in the morning for single travellers without kids. The breakfast buffet was excellent with a lot of variety, and the food was tasty and fresh. The room was spacious, clean and comfortable. Overall, the hotel is suitable for single travellers, families or business travellers. The location right next to a metro station is good. It was a great Location for the Vienna Marathon Start and getting to the centre. Staff were very helpful. Rooma bit old. No possibility to eat in the evening. Not much of an atmosphere. A large room with microwave and fridge, very handy for M1 metro line straight into Stephansplatz. It is also a 25 minute brisK walk to the UK over the Danube ( or 2 stops on the metro). There is a Spar supermarket across the road and a lovely cafe on the other corner. Breakfast was good. Location is really wonderful, it is near the metro station Vorgartenstrabe, Prater Park and Billa which is open on Sunday (in the railway station Praterstern). The location is great - 10 Min by walk from Prater, 10min by metro to city centre or 40 Min of Nice walk. Thé hotel is great, rooms are big and very comfy bed. The stuff is very helpful and nice. Breakfast had the same menu for 7 days ; bit of variety helps. Gym was pretty basic ; no weights! Wi-fi asked for password everytime we came back from outside. Location was great ; just next to U station. Staff was friendly and always helpful. Room was clean.